Viessmann Vitodens 100-W Review | Is this one of the Best Boilers in UK? Viessmann Vitodens 100-W Review is a top search term since it was adjudged a “UK Best Buy” by one of the most prominent independent UK Consumer Research magazines. These condensing gas boilers are one of the highest efficiency boilers available not only in the UK, but around the world. They also sit at an attractive price point compared to other boilers available in the UK. That often times gives people the impression that it’s a cheap boiler. But Viessmann Boilers are one of the most technologically advanced boilers available in the world at the moment. 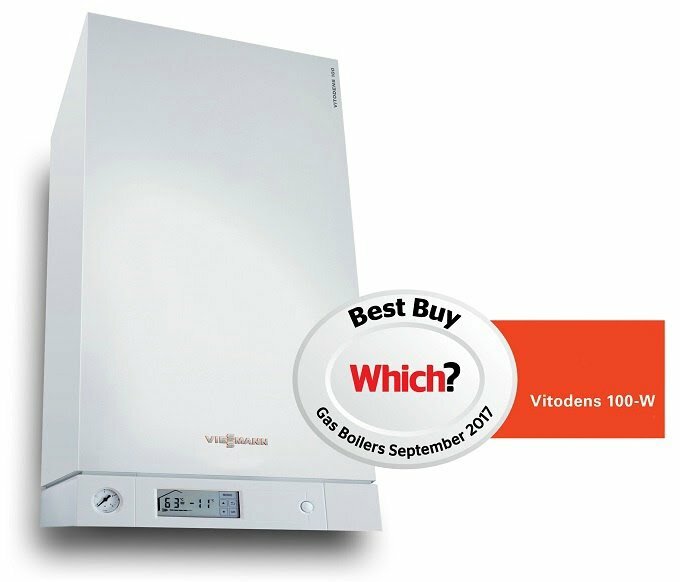 How do Viessmann manage to keep the price low, and more importantly, is the Vitodens 100-W boiler any good? Let’s find out. One of the biggest international manufacturers of commercial heating systems, Viessmann have rapidly become the domestic boiler of choice around the world as well. Viessmann, founded in 1917, has over 12,000 employees across the world. They are truly international with presence in 12 countries with 23 production divisions, subsidiaries and representations in 74 countries, and 120 sales offices around the world. Viessmann’s commercial boilers heat some of UK’s biggest establishments, including Cardiff’s Principality Stadium. Their foray into the UK market has been comparatively recent, 1989. They are headquartered today at Telford. And their current product range includes gas, oil, steam and biomass boilers, hot water cylinders, combined heat and power generation, photovoltaics, air and ground source heat pumps, refrigeration cabinets, coldrooms and biogas plants. 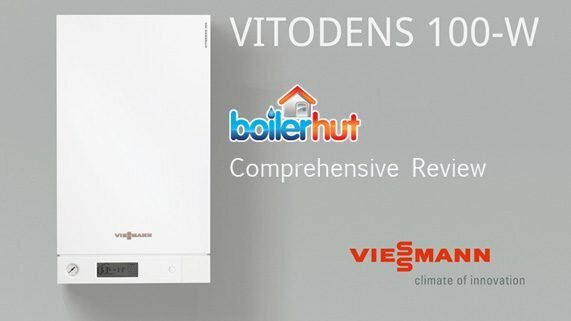 As Viessmann Approved Installers, Boilerhut have installed thousands of Viessmann Vitodens 100-W review boilers all over the UK. These are fantastic boilers, with ErP Heating Seasonal Efficiency of 94% on the 100-W and a whopping 98% on the Vitodens 200-W (which is a higher end model). And because they are designed to be lightweight and compact in their dimensions, installers find them very easy to site and install. What’s more, they are consistently regarded as one of the quietest boilers in their class, at noise emission levels of only 35dB, so you don’t hear the boiler humming when you’re trying to catch a warm, quiet night’s sleep. Let’s delve deeper into the nitty-gritties of the Viessmann Vitodens 100-W Review. Viessmann Vitodens 100-W review boilers are made in Germany. Now, before we go all patriotic and say we should only buy British boilers, there are no true “British boilers” anymore. Worcester are owned by Bosch. Vaillant is German. Baxi are headquartered in The Netherlands etc. etc. We can go on and on, but the reality is the clothes and shoes you wear are made in India, your electronics in China, and pretty much everything else is outsourced too. Now, as far as high efficiency condensing boiler supremacy goes, Viessmann are the undisputed leaders in Germany, and in most of Europe with close to 70% market share. Germans prefer quality and efficiency over money, whereas in the UK, price and brand reputation are the biggest motivating factors. All that is changing however as Viessmann’s market share in the UK is increasing year-on-year. Now, I am sure we all can agree that German engineering is all about efficiency and innovation. 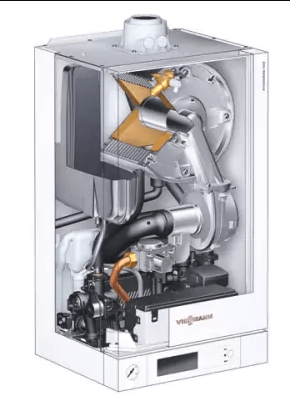 Viessmann have years and years of experience in the manufacturing of gas-fired wall mounted condensing boilers, and they have refined them over all those years with innovative technology and services. Plus, they have high standards of product quality and performance, which means even if their earlier models had reliability or parts problems, Viessmann worked hard on rectifying those and building a more robust, reliable and efficient product. One of the earlier complaints that Viessmann boilers faced was non-availability of parts. Which is something they have also rectified by investing in a goods distribution/logistics centre in Telford, Shrophsire. All Viessmann boilers, kits and parts are also available at all Plumbases across the UK. So, not only are Viessmann Vitodens 100-W boilers one of the most efficient and reliable boilers you can buy in the UK in 2018, in the rare event of any problem with the boiler, a Viessmann engineer can be at your doorstep within 24-48 hours, and parts can be replaced just as quickly. Stainless Steel, especially Inox, is the highest grade of stainless steel available. Inox Stainless Steel is more efficient, reliable, durable and corrosion resistant compared to aluminium. This helps Viessmann achieve 94% ErP efficiency on 100-W and 98% ErP efficiency on 200-W. Almost all major boiler manufacturers in the UK source their aluminium heat exchangers from third parties. Manufacturing it in-house gives them the freedom to sell their boilers at an attractive price point. 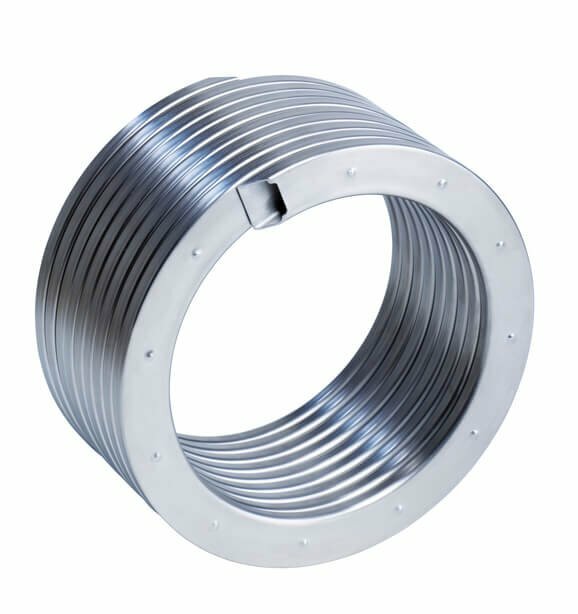 Because of the durability of stainless steel, Viessmann can offer 10 years warranty. If you are looking at renovating or modernising your property, the Viessmann Vitodens 100-W condensing boiler makes for an ideal replacement for older boiler systems. Using a Viessmann CFS (combined flue system) means multiple boiler flues can be routed to exit from one exit point, whether it’s through the roof or through the wall. Viessmann’s entire boiler range also have combined PRV and condensate connections that can also be routed in to the CFS, and one single drain at the base of the system is all that is required to remove the condensate, without the need of ugly pipes protruding through the external walls. *Currently only compatible with the 200-W. New Viessmann controls coming soon for the 100-W.
Viessmann’s Vitotronic remote control units are ideal for use in living spaces. Not only do they look great with a modern glosssy neat design, but with Viessmann’s standardised operating philosophy, they are fairly easy and intuitive to use helping you to manage your heating system at all times. The control unit pictured above is only compatible with the Viessmann 200-W and above models. 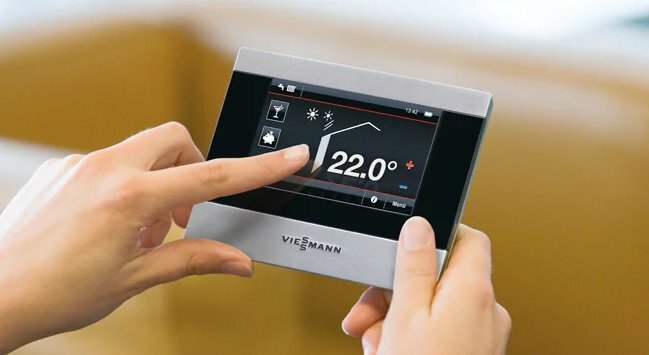 But with the new building regulations coming to the UK, Viessmann are about to introduce their own range of smart controls for their entire boiler range, including the Viessmann Vitodens 100-W Review and 050-W.
On top of winning “UK Best Buy” awards, or pumping out a whopping seasonal efficiency of 94% and 98% (on 200-W), or dominating the German and European markets, or having our engineers and installers singing its praises, I think our verdict is pretty straightforward. You simply cannot go wrong with choosing a Viessmann boiler in 2018, especially the Vitodens 100-W. What’s more, if you get the boiler installed by a Viessmann Premium Partner and Approved Installer like Boilerhut, you will have your boiler installed to the highest standards. And because we can get you extended 10 year warranties at exclusive online prices, you can enjoy trouble free winters with your family for the next decade at the very minimum. And because their Inox-Radial Stainless Steel Heat Exchanger is built to last, we expect these Viessmann boilers to last decades. In the Republic of Ireland who are the recommended installer of the Vitodens 100W. Thanks for your comment. I have sent an email to you with more information. Hi. Great article thanks. Just wanted to know, do you have to pay extra for the extended 10yr Warranty, when fitted by approved Viessmann installers like yourselves please? Apologies for the late reply. You don’t have to pay extra for 10 year warranties on the 100-W and 111-W models. The 050-W has 7 years warranty on the boiler and 10 years on the heat exchanger, but the boiler warranty may be extended to 10 years at a nominal cost. Is it a full warranty, i.e. parts & labour? Or just parts? I remember the likes of Hotpoint advertising long warranties, but they’re not what they appear and usually involve a £££ cost to take advantage of. Hi Craig. It’s definitely parts & labour. And 10 years on the heat exchanger across Viessmann’s entire range. I would also like to know who installs vitodens 100w in the ROI. I live in Dublin. I’ve emailed you with the information. Please check your inbox. Can the 100w link to a Web app and mobile phone..? Thanks for your comment. Yes, the 100-w can link to a web app and mobile phone. Viessmann’s recommendation on the 100-W model is a Tado Smart Thermostat. However, Boilerhut recommend a Nest 3rd Generation Smart Learning Thermostat instead. Can you pls advice who can install in in Ondon, I live at Walthamstow E17 and your installation fees. Also pls advance which boiler to purchase, I live in a 2 bed flat, 1 toilet, kitchen and sitting room. Thanks for your comment. We’re a national installer of Viessmann boilers. For your property size, we will recommend either a Vitodens 050-W 29kw, or a Vitodens 100-W 30kw. I’ve sent you an email with more information. I will be replacing my 20year old Worcester boiler within the next 3 months and I was wondering which Viessmann boilers I should consider. I live in a three bed semi, one bath with shower over it, lounge, dining, kitchen and decent sized hallway. How long is a typical installation and would you fit new rads in some rooms? 1. I will be replacing my 20year old Worcester boiler within the next 3 months and I was wondering which Viessmann boilers I should consider. I live in a three bed semi, one bath with shower over it, lounge, dining, kitchen and decent sized hallway. After having a quick chat with one of our in-house heating experts, we’d suggest either a Viessmann Vitodens 050-W 29kW or the Viessmann Vitodens 100-W 30kW model. 2. How long is a typical installation and would you fit new rads in some rooms? A typical combi to combi swap can take 1 day. Converting to combi from different versions can take between 1-2 days or more depending on how much work needs to be done. We can fit new rads, no issues.